During last few days salmon fishing has been very good on River Tornionjoki. Finnish Game and Fisheries Research Institute (FGFRI) is monitoring the salmon spawning runs into the Tornionjoki by a DIDSON (Dual Frequency Identification Sonar) echo sounder at Kattilakoski Rapids, 100 km upstream from the Baltic Sea. By June 23 already 20 480 salmon had passed the counting site. That is much higher number of salmon than it was in last year and in the year 2012 at the same time. The salmon spawning runs into the Tornionjoki have been monitored since 2009. In 2013 a total of 53,600 salmon were observed to pass the counting site. 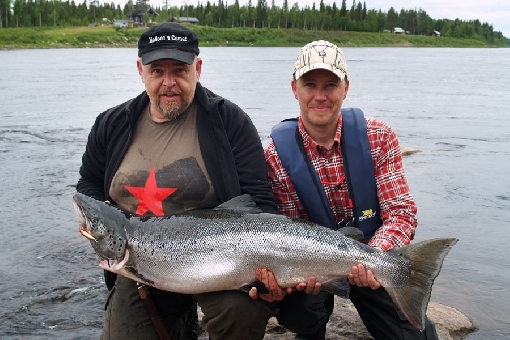 In 2013 the total salmon catch from the River Tornionjoki was 72 tonnes, which is less than the record catch in 2012 (122 tonnes) but over twice as high as the average catch (28 tonnes) in the time series started in 1982.